« The Janeway Paradox: Reclaiming my Geek Card. Through sheer happenstance and the good graces of a friend, this blogger was able to view The Hobbit: The Desolation of Smaug much earlier than I had expected, so here I am with a review for your consideration. Having read The Hobbit novel some years before even The Lord of the Rings was adapted to film, I was dismayed to learn that the story was going to be forced into a trilogy, because, well, money. The story could have been ably told in, at most, two installments, but alas, this is what we have to work with. On we go. With much of the exposition and character introductions taken care of in The Hobbit: An Unexpected Journey, Desolation of Smaug doesn’t waste much time before throwing us into the thick of the action. Gandalf, Bilbo, and the dwarves continue to be stalked relentlessly by orcs and wargs while on their way to The Lonely Mountain, despite having given them the slip at the end of the previous film. The group takes up temporary residence with a shapeshifting werebear before they finally arrive at Mirkwood. This stretch of the film, the flight to Mirkwood and the following sequence inside the forest, were for me the most enjoyable moments in the film. The interior of Mirkwood in particular is a visual treat, and the illusions inside it that prey upon Bilbo and co. are fascinating to watch. When the giant spiders return, we are treated to some classic action and brief comedy as Bilbo outwits the bad guys and saves the dwarves. Wait, didn’t we see that in the first movie? It is here that the movie starts to take a turn toward left field, and never quite returns. Legolas, in what was surely a grand marketing ploy, is inserted into the story where he never was in the book, along with an elven potential love-interest who is completely made up altogether. The action sequences once the elves show up start to get a little hammy; a little too much obvious 3D, a little too much straining of credibility. This may be fantasy, but fake and hokey looking combat sequences need to be called out for what they are. Desolation of Smaug is a very mixed bag of tricks as we continue on the journey out of Mirkwood, to Laketown, and watch as the dwarves get themselves captured, yet again, by yet another group of people. The tale begins to get really repetitive here, and the entire Laketown sequence just drags. When we finally are able to see the dwarves arrive at The Lonely Mountain, the film returns to a sense of grandeur and simplicity, more of what the original book projected, in my mind. The sequence leading up Smaug’s reveal is handled with a nice balance of awe and humour. However, Smaug himself left something to be desired in my book. Benedict Cumberbatch was an excellent choice to use for giving the drake voice, but the way the great dragon is rendered and animated is disappointing. After having done such great work with Gollum before, it is disheartening to see that Smaug never looks quite convincing. When CGI looks so lifeless and obviously fake that it takes you out of your sense of immersion, it is to me a serious issue. The very near end of the movie features yet another sequence that was never in the book, and while that in and of itself is not automatically bad (Lord of the Rings had a few liberties taken), this one just clangs to the floor. The entire sequence of the dwarves flash forging a gigantic statue of gold to dump onto Smaug is just very silly and facepalm inducing. And the movie ends with Smaug flying toward Laketown. Roll credits. Leaving one to wonder how much filler will be needed to pad out the inevitable third entry this time next year. 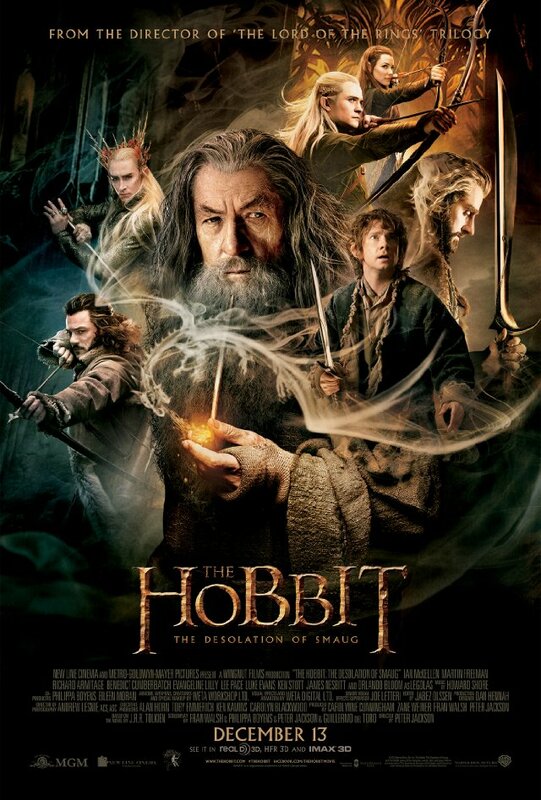 Despite my negativity, I did still find Desolation of Smaug to be entertaining, and enjoyable at many turns. Middle Earth remains a wonderful place to explore and indulge one’s self in. However, this forced trilogy of Hobbit movies is coming up woefully short of the standard set by The Lord of the Rings trilogy. Nice review-I’m very excited to see this for myself! i really enjoyed the first Hobbit, I don’t mind the changes that were made honestly…. I really didn’t mind the liberties taken by Peter Jackson and Co. in The Lord of the Rings, and even in the first Hobbit movie I didn’t find anything about it that excessively grated me. But this second entry just really goes too far with the changes in my opinion.